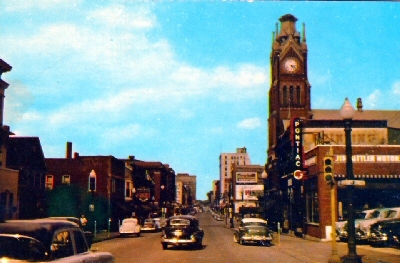 "Downtown Moline, Illinois - Circa 1945. " (1921) POSTCARD: Downtown Moline, Illinois - Circa 1945 - Condition: Very Good. - Not Posted. Picture of downtown looking east. Wonderful street view of businesses and cars. Pontiac Dealership is in the forefront. Price: $4.00 + shipping.